Holding a party is always great fun, but it can be daunting too. There is a lot to be done, and making sure that everyone has enough food is not an easy task. You have to think about what your guests like to eat, work out the quantities, do the shopping, and the cooking as well as serve it all. That is a lot of work and stress, which makes it hard for you to enjoy your party. 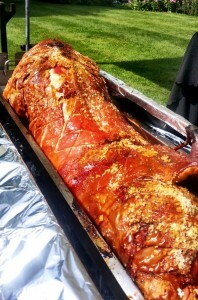 Fortunately, there is a good alternative, which is to hire us at Hog Roast Ayrshire and let us do all of the hard work. Over the years, we have catered for all kinds of events, in and around Ayrshire. Whether you are holding a small family get together, a corporate event of a huge wedding, we will provide you with fantastic food that is sure to impress your guests. Our modern hog roast machines cook any meat to perfection. The sight of a whole spitting pig roasting is an impressive one, but a spit full of whole turkeys, beef joints, lamb or chickens also looks good. Any spit-roasted meat tastes fantastic. The fact that it is constantly turning over the heat source ensures that comes out moist and evenly cooked. Spit roasted meats go well with any style of food. Our team of experienced chefs can also provide you with a range of tasty side dishes, salads, desserts and canapés. You just have to choose the type of food you want served. We then work out how much is needed and take care of all of the cooking. If you prefer to do the cooking yourself, you can easily hire a spit roaster from us. On the day, a member of the Hog Roast Ayrshire team will deliver the machine and show you how to use it. When your event is over just let us know and we will take it away and clean it for you. To order your hog roast feast from us, all you need to do is to fill in the quote form.